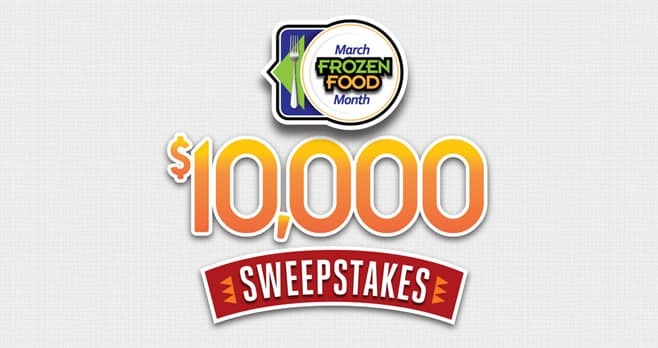 Celebrate March Frozen Food Month in a big way by entering the Easy Home Meals March Frozen Food Month $10,000 Sweepstakes. You could win the grand prize of a $1,000 Grocery Store Gift Card or 1 of 18 $500 Grocery Store Gift Card prizes. The Easy Home Meals March Frozen Food Month $10,000 Sweepstakes IS OPEN TO LEGAL RESIDENTS OF ONE (1) OF THE FIFTY (50) UNITED STATES, THE DISTRICT OF COLUMBIA AND PUERTO RICO WHO ARE THE AGE OF THE MAJORITY WITHIN THE JURISDICTION FROM WHICH THEY RESIDE ON THE DATE OF ENTRY TO BE ELIGIBLE. The Sweepstakes begins at 12:00 AM EST on February 25, 2019 and ends at 11:59:59 PM EDT on April 1, 2019. Limit one (1) Entry per email address per day during the Sweepstakes Period. The grand prize consists of a $1,000 Grocery Store Gift Card. Visit www.easyhomemeals.com to enter and see Official Rules for details.